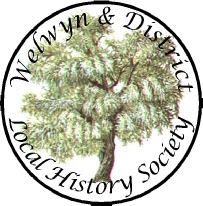 This website has been prepared by the Welwyn & District History Society from public documents and information supplied by contributors. Whilst every effort has been made to ensure the accuracy of information contained in the site, the Society cannot guarantee that accuracy.Your use of any information on this website is entirely at your own risk, for which we shall not be liable. We would be grateful if you could advise us of any errors which you may find, which we will correct after verifying the details. Every care has been taken to ensure that we have permission to use the images contained within our website and to acknowledge the source. However in some cases we may not have been able to determine the original owner of some images or may have omitted to acknowledge the source. If you identify any image for which you believe you hold the copyright and which we have used without your permission or we have not correctly acknowledged you as the source please contact us so that we can investigate the matter and correct accordingly.